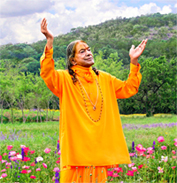 Kripalu Maharaj (wrote the Prem Ras Siddhant in reconciliation of all the philosophies of the Jagadgurus of the last 5,000 years. In this book, Kripalu Maharaj gives regard to all the religions, and in so doing explains and clarifies all of the relevant issues that serve to inform whosoever desires God's love. The first chapter of Prem Ras Siddhant focuses on the ultimate aim, the ultimate desire of every soul. Further, in order to clarify what the universal aim of human life is, it reconciles the belief systems of spiritualism and materialism, of materialists or positivists and the saints. What motivates humans in their actions? Even though it might seem as though the 'purposes' behind the manifold actions of which humans are capable are numerous, the reason is always one and the same. We seek pleasure in this life. Whether knowledge, liberty, pursuit of a family, of material comfort, all of our actions are performed with the intent to attain happiness. This case is proved by the actions of wicked people. Why do wicked people perform cruel actions? This is because 'wicked people get pleasure upon witnessing the sufferings of others,' as it is said in the Prem Ras Siddhant. For saints, the direction of their actions is opposite those who are wicked: they work for the welfare of others. Why do they work for the welfare of others? Because they feel joy upon seeing other people joyful. Thus, all people, both wicked and saintly alike, perform deeds in order to attain happiness. Adhyatmic: These are afflictions of the body and mine. They can be cause by fever and other bodily ailments, or else they can be of a mental origin. Lust, anger, greed and other such dispositions and mood states are considered to by adhyatmic. Adhibhautik: The afflictions are cause by other living beings such as animals or men. Adhidaivik: The third kind of human sorrow is cause by higher powers, also called 'supernatural', and include cold, rain, extreme heat, floods, and the like. So many of our actions are completed with the thought in mind to protect ourselves against these, to insure and ensure an existence without illness or homelessness, or minimally, to be able to afford a doctor should we chance to fall ill. In other words, we work to eliminate suffering. Yet the elimination of sorrow is yet another way to say that we would rather be filled with joy, with bliss. Thus, all of our numerous efforts to combat suffering are another way of saying that we labor to find bliss. The fact that the supreme aim of our existence is ever and forever oriented towards happiness, towards bliss is further evidenced by the universality of truth, nonviolence, forgiveness, compassion, and love. One could counter that it is only the few, the saints, who are moved by these godlike attributes and conditions. But if we dig deeper, we find that even the most foolish or most wicked person is unable to approve of falsehood, theft, immorality, and cruelty. How can this be so? Take the example of the thief who claims that stealing is a positive way to earn one's keep. Steal from the thief, and watch him crumble in misery. And the liar? Who has ever found a liar to feel joy at being lied to? Thus, the depths and heights of our soul feel a strong aversion to wickedness just as much as they feel a step closer to joy or elation when we embody our divine attributes, those attributes exemplified by the saints. From this we conclude that our every action is undertaken to attain bliss. The true philosophy of bhakti yoga is just this, that the ultimate aim of human life is to experience absolute and perfect happiness and love. Bhakti yoga is the process of unlocking this happiness. As Kripalu Maharaj says, “Don't think that Krishn is Almighty Supreme God Who is not easily accessible to common souls. He is just yours… is the recognition of our sweet relationship with Krishn. It directly relates to God Krishn Who is beyond this world of maya.” This sweet relationship is precisely our bliss.